For the village in Nepal, see Rawalkot. 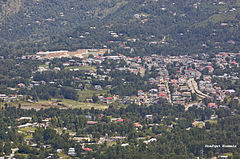 Rawalakot (Urdu: راولا کوٹ ‎) is a capital city of Poonch district in Azad Kashmir, Pakistan. It is located in the Pir Panjal Range. Its other name is Pearl Valley because the abundance of almond blossoms in the valley in summer gives the impression of scattered pearls when viewed from a mountain. It is the heart land of Sudhan tribes which had contributed about sixty thousand soldiers to the British Army during World War II. Rawalakot is located at Latitude 33°51'32.18"N, Longitude 73° 45'34.93"E and an Elevation of 5374 feet. Rawalakot is approximately 76 kilometres (47 mi) from Kahuta and about 120 km (75 mi) from the city of Rawalpindi, Pakistan.. It is linked with Rawalpindi and Islamabad via Goyain Nala and Tain roads. Via Kotli Satiyan and Kahuta. It is also linked with Rawalpindi via Sudhnuti. Rawalakot is surrounding by many villages Tain Patola, Tain, Dera Sadozai, Manjari Shareef, Tain Dhalkot,(Namrala bangoin) Chirooti, Bhagiana, Pachiot, Datote, Barien, Ballari, Argali, Paniola, Zairat, Kharian, Laghriat, Singola, Thorar, Mong, Androte, Rehara, Hurnamaira, Chapharaban, Tarnuti, Kottera, Barian Pothi, Khayi Gala, Qoiyaan, Kharick, Rairbun, Topa Soon, Kaimon, Titrot, Motialmara, Trar Dewan, Chaire, Chapanidahar, Chuck, Tranni, Dahmni, Parat, Pothi Bala/Makwalan, Kharek, Pakgali, Paniola, Banakha, Khayt Chrian, Mohri Farman Shah, shuja Abad, Cheahr, Barmang, Chak, Dreak, Banjosa, Hussainkot, Hurnamera, Tarnuti, Thorar, Lunjgran bandar, Rehara, Bangoin, Jandala, Timrot, Jehlary and Thala, Pachiot, Bhagiana Shoukat Abad,Duckola, Nakkar, Nailyaan, Kheeryan, Toli Pir. Bagh District lies to the north and Sudhnuti District lies to the south of Rawalakot. Construction of the Ghazi-e-Millat road (also known as Guoien Nala road) between Rawalakot and Azad Pattan has considerably reduced travel time, it is main road which is connecting Islamabad/Rawalpindi to Rawalakot city. A bus across the LOC, the Poonch-Rawalakot bus has helped to re-establish ties across the conflict torn region. The road passing through Pakgali-Paniola connects Rawalakot to Bagh, Rawalpindi and Muzaffarabad. The other road that passes through Mohri Farman Shah, Shuja Abad is the shortest possible road link that connects Rawalakot city with Bagh. Murree, Islamabad and Rawalpindi are in a southward direction from Rawalakot. The town has another road link with Kotli. Rawalakot Airport is non-operational, as there is no demand for the air service provided by Pakistan International Airlines. The airport has been closed since 1998. However, plans are to restart it soon. Rawalakot features a subtropical highland climate under the Köppen climate classification due to high altitude. Rawalakot's weather is quite erratic. However, the climate of Rawalakot can be divided into four seasons, namely spring, summer, autumn and winter. Rawalakot has mild to warm temperatures during the spring and autumn, humid temperatures during summer and cold to snowy during the winter. The temperature can rise as high as 38 °C (100 °F) during the mid-summer months and drop below −1 °C (30 °F) during the winter months. Snowfall occurs in December and January, while most rainfall occurs during the monsoon season stretching from July to September. Due to lack of opportunities, most citizens of Poonch, including Rawalakot are looking for ways to get employment in other countries. Moreover, it is not uncommon for qualified youth from the city to find employment in larger cities like Rawalpindi/Islamabad and Peshawar. Rawalakot has an urban population of 79,000 people according to a 2015 estimate. Pakistan and India agreed to facilitate travel between the two parts of disputed Jammu and Kashmir by providing entry permits to divided Kashmiri families to travel across the Line of Control (LOC). Thousands of divided families are living on either side of the LOC since 1948 after a cease fire line was drawn which divides Kashmir between Pakistani Kashmir and Indian Kashmir. The cease fire line was turned into the Line of Control (LOC) after the Simla Agreement between India and Pakistan in 1972. Both countries started bus services between the two divisions of Jammu & Kashmir in April 2005 for families to reunite and truck service in October 2008, for businesses to flourish. The Poonch-Rawalakot bus service was started on 20 June 2006 through Tatrinote and Chakan Da Bagh point. A total of 87 persons on first day crossed the Chakan Da Bagh point on foot after coming on board the two buses on either side. Two privately owned cable television systems are available in Rawalakot, which carry Pakistani and international television programs. In addition, A local FM radio station named Voice of Kashmir FM 105 is also functioning in the area. This radio station is part of a network of three radio channels. The other two channels are VOK FM 105.6 (Bagh) and VOK FM 105.4 (Muzaffarabad). Cell phone services are also available in this region. They include major cell phone operators: Zong, Mobilink, Ufone, Warid Pakistan, Telenor and SCOM. PTCL Wireless telephone service is also available here. Wateen Telecom installed a fiber optic link connecting Rawalakot to Pakistan, backhauling cell phone traffic to the network in Pakistan. SCO-the local phone company is operated by . This telecom provider is responsible to provide landline telephone network with minority shares of other operators. All major mobile phone companies operating in Pakistan provide their services in Rawalakot. Broadband internet access is available from DSL. WiFi hotspots are also available to a very limited areas that include some parts of Rawalakot city, Dehra & Kharick. 2005 earthquake relief in Rawalakot. Cuban Field Hospital. 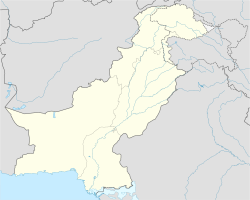 On Saturday, October 8, 2005 a 7.6 magnitude earthquake killed 73,338 people and left up to three million homeless in Pakistan, including Azad Kashmir. The city of Rawalakot, the capital of the Poonch, suffered significant damage from the 2005 Kashmir earthquake; although most of the buildings were left standing, many of them were rendered uninhabitable, and some of the population was left homeless. Most of the buildings have been reconstructed. In addition to the Agriculture University of Azad Kashmir, Now The University of Poonch Rawalakot, UPR publishes the newsletter quarterly. You can find the updated information on recent activities and events. New appointments, events, student activities. Rawalakot has a medical school ; Poonch Medical College, a Government College for men and women, numerous higher secondary schools/high schools, and a number of private schools. During the earthquake of October 8, 2005, many degree colleges were badly damaged. Most have been rebuilt so for. Rawalakot city and its surroundings are very peaceful and beautiful. Most people living here are Sudhans. They moved to the Poonch district of Kashmir region some centuries ago. The daily Dharti Rawalakot is an Urdu language news paper published from Rawalakot. The monthly Join Hands is also published from Rawalakot. Daily newspapers from Pakistan are available in English as well as Urdu. Voice of Kashmir FM 105 Rawalakot. Icon Network Cable Television and Satellite Television Service is widely available. Parhari writers include Muhammad Sagheer Khan, Liaqet Laiq and Hameed Kamran. a Pakistani TV drama director Nadeem Siddique and Sheeraz Kashmiri Author and Journalist also belongs to Rawalakot. Daily Perel News is also a good name of Rawlakot press media. Banjosa and Toli pir two popular tourism destination in this area. Lodges, government-owned and private guest houses, and hotels are available in different parts of Rawalakot. Attractions include: mountain-based adventure tourism, rock climbing, mountaineering, trekking, summer camping and hiking, water-based adventure tourism, and paragliding. A Temple is located about two kilometer away from city Rawalakot near the upper block Faculty of Veterinary & Animal Sciences, The University of Poonch. Standing near the temple presents a charming sight of Rawalakot city also the beautiful view of University of Poonch. Rawalakot has a downtown area, which consists of shops selling everything from groceries to electronic goods. ^ Hashmi, Iqbal (1993). The Bleeding Kashmir. Royal Book Company. p. 67. ^ "Rawalakot, Azad Kashmir". Climate Charts. Retrieved 14 June 2013. ^ "Population of Azad Kashmir Areas". Citypopulation.de. Retrieved 2018-10-15. ^ "Special Communications Organization". Sco.gov. Retrieved 2012-10-01. ^ "Earth Quake 2005". Drgeorgepc.com. Retrieved 2012-10-01. ^ "Radio FM 105 Rawalakot Station live | AJKLive | Azad Kashmir". AJKLive. Retrieved 2012-10-01. This page was last edited on 8 April 2019, at 10:28 (UTC).